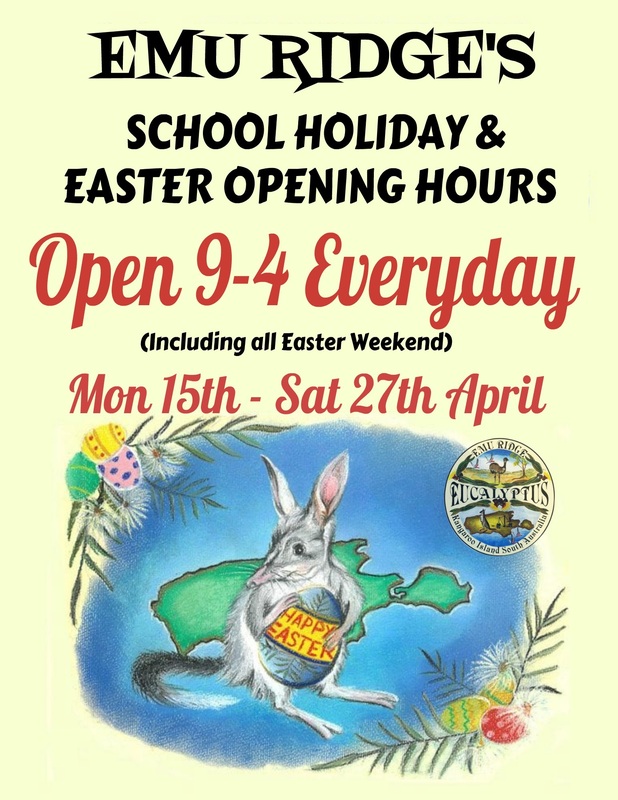 Larry, Bev and the Emu Ridge team hope everyone has a lovely Easter Break. We are going to be open for everyone everyday 9am – 4pm. Enjoy our Eucalyptus Oil and Natural Products, Local Produce, Kangaroo Island Cider Tasting and Sales and the Cafe. 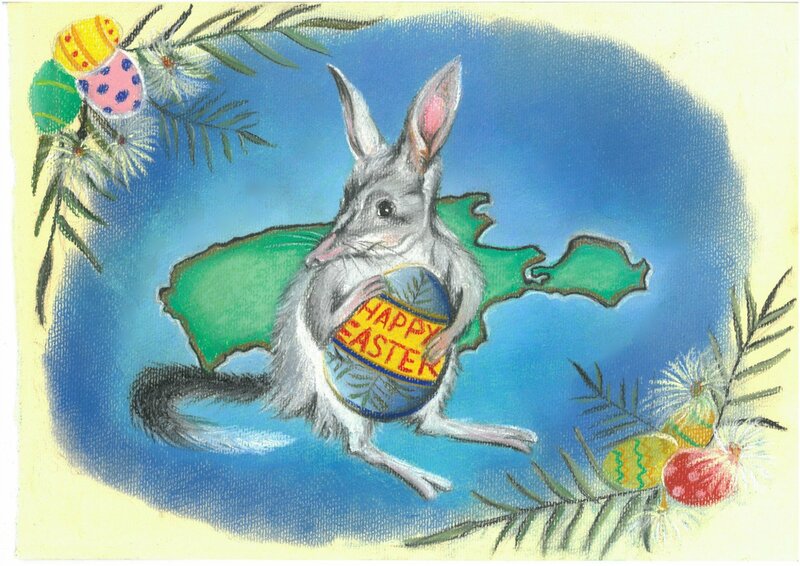 This lovely Easter Bilby artpiece painted by our volunteer Laura Hepworth, an artist from the UK. If your not sure what a Bilby is see below. We are all about Australian Natives so we are using our Native Bilby for our Easter wishes. Bilbies, or rabbit-bandicoots, are desert-dwelling marsupial omnivores; they are members of the order Peramelemorphia. At the time of European colonisation of Australia, there were two species. The lesser bilby became extinct in the 1950s; the greater bilby survives but remains endangered. It is currently listed as a vulnerable species. It is on average 55 cm (22 in) long, excluding the tail, which is usually around 29 cm (11 in) long. Its fur is usually grey or white, it has a long pointy nose and very long ears, hence earning its nick-name, the rabbit-eared bandicoot. Bilbies Burrow for Safety! Greater Bilby in captivity. Photo: Queensland Department of Environment and Heritage. The Bilby is an important part of traditional indigenous culture in the deserts of Central Australia. The large rabbit like ears of the Greater Bilby (referred to as Bilby) have also made it a popular Australian icon at Easter. Sadly, through habitat loss and competition with introduced animals, the number of these small mammals has dramatically reduced over the last 100 years. As members of a group of ground-dwelling marsupials known as Bandicoots, Bilbies have long pointed snouts and compact bodies. Bilbies measure between 29 and 55cm in length and differ from other Bandicoots by their larger ears, long silky fur and longer tails. Bilbies are remarkable burrowers, using their strong forelimbs and claws to build extensive tunnels. One Bilby may make up to twelve burrows within its home range to use for shelter. They have long slender tongues that they use to eat a specialised diet of seeds, insects, bulbs, fruit and fungi. Bilbies are active at night, sheltering in their burrows during the daytime. A hundred years ago, Bilbies were common in many habitats throughout Australia, from the dry interior to temperate coastal regions. Changes to the Bilby’s habitat have seen their numbers greatly reduced and today the species is nationally listed as vulnerable. They now occur in fragmented populations in mulga shrublands and spinifex grasslands in the Tanami Desert of the Northern Territory; in the Gibson and Great Sandy Deserts and the Pilbara and Kimberley regions of Western Australia; and the Mitchell Grasslands of southwest Queensland. While there are many threats contributing to the dramatic decline of Bilby populations, the most important of these are habitat loss and change, and competition with introduced animals. As agricultural activities extended over the more fertile regions of Australia the Bilby’s habitat has changed rapidly. Changing fire patterns also affect the type and abundance of food plants. Competition with introduced animals is a major threat as domestic stock like cattle and sheep eat the same plants. Rabbits compete with Bilbies for their food and burrows and foxes and feral cats also prey on them. Having disappeared from the areas intensively grazed by livestock as well as those areas densely populated by Rabbits, Cats and Foxes, Bilbies now only survive in small isolated populations in the driest and least fertile regions of arid Australia. re-establishing Bilbies in areas where they previously occurred. The ‘Save the Bilby’ project, based in the Queensland town of Charleville, is an example of a few determined individuals making a big difference. The local team aims to build a predator-proof enclosure surrounding part of a national park to reintroduce Bilbies into far western Queensland. They have raised money for their project by running “meet the Bilby” evenings, with a talk, video and meeting of the captive Bilby breeding colony, and by selling Bilby merchandise in shopping centres across southern Queensland.